Dr. Fairgrieve was originally trained in Physical Anthropology at Erindale College, University of Toronto (Hons. B.Sc.) from 1982 to 1986, under the supervision of Dr. Jerry Melbye of the Department of Anthropology. Upon graduation, Dr. Fairgrieve pursued his M.Phil. in Biological Anthropology at the University of Cambridge, England. His thesis, entitled "The Pasamayo Crania of the Hutchinson Collection, a Pathological and Nutritional Assessment" was supervised by Professor James Garlick of the Department of Physical Anthropology. Subsequently, Dr. Fairgrieve returned to pursue his Ph.D., once again, under the supervision of Dr. Jerry Melbye. Dr. Fairgrieve's doctoral thesis is entitled, "Amino Acid Residue Analysis of Type I Collagen in Human Hard Tissue: An Assessment of Cribra Orbitalia in An Ancient Skeletal Sample from Tomb 31, Site 31/435-D5-2, Dakhleh Oasis, Egypt." Prior to defending his Ph.D., Dr. Fairgrieve, was trained in Forensic Anthropology at the National Museum of Natural History, Smithsonian Institution, in Washington, D.C., under the direction Dr. Douglas H. Ubelaker and instructed by Dr. William Bass from the Department of Anthropology at the University of Tennessee. In 1991 Dr. Fairgrieve secured a cross-appointment between the Anthropology Program and the Department of Biology at Laurentian University. Since obtaining his Ph.D. in 1993, Dr. Fairgrieve has steadily conducted research in human skeletal biology and forensic anthropology with numerous publications and research projects. In 1998, he founded the "Forensic Biology Option" within the Honours B.Sc. in Biology at Laurentian University. In 2004, Dr. Fairgrieve became the founding Chair of the Department of Forensic Science at Laurentian University. 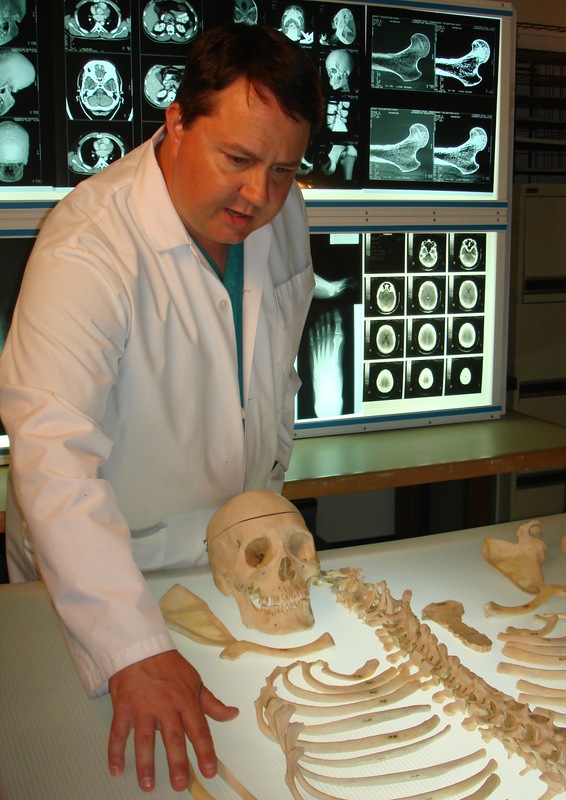 As Director of the Forensic Osteology Laboratory, he is the Forensic Anthropology consultant to the Office of the Chief Coroner of Ontario and the Ontario Forensic Pathology Service, working with the Northeast Regional Forensic Pathology Unit (Directed by Dr. Martin Queen) in Sudbury, Ontario. Dr. Fairgrieve is published in the areas of forensic anthropology, microscopy of bone, and the analysis of intentionally burned human remains. He has testified as an expert witness in Canada and the United States. Dr. Fairgrieve's research is concentrated on the effects of fire on the human skeleton in forensic contexts. Particularly, Dr. Fairgrieve is interested in the effects fire has on our ability to detect and interpret cut marks, stab wounds, and other forms of trauma on skeletal tissues. Dr. Fairgrieve's research has also included collaborative research in the areas of forensic botany, and bloodstain pattern interpretation. Establishing Correspondence in Wood: The Challenge and Some Solutions?